Summer is the best time of year. We get out of our winter hibernation and spend time out and about having fun. It is always a difficult balance to find time to do everything that you must do, like home maintenance, while still enjoying the weather, but we learn to balance as best as we can. Home maintenance is essential to protect what is arguably the largest investment you will make in your lifetime, as well as help to maintain and sustain it for the next 100 years. Keeping our exterior siding in good shape is extremely important. The siding, whether it is wooden, brick, vinyl or aluminum, takes a beating all year round with extreme heat, cold and moisture. As responsible homeowners, we need to make sure that we are doing all we can to allow it to work properly. It is important to walk around your home every so often to make sure that your siding is intact. If any is loose, missing or damaged, it can allow moisture and pests to get behind it and potentially cause a lot of damage. “A house with wood siding is most vulnerable to water infiltration where siding butts against windows, doors, and corner moldings”, says Frank Lesh, a professional house inspector in Chicago and past president of the American Society of Home Inspectors, on houselogic.com. Look for caulk that has cracked due to age, or has pulled away from adjacent surfaces, leaving gaps. Reapply a color-matched exterior caulk during dry days with temperatures in excess of 65 degrees. Lesh also stresses that no bushes, tree branches, or shrubbery be allowed to touch the house siding. Foliage conducts moisture that can find its way into cracks and tiny openings in siding. “You should have enough room to comfortably walk between your house and any plant materials,” he says. Exterior painting/staining is a great way to boost curb appeal as well as help to protect your wooden siding. LakewoodAlive offers the PaintLakewood! Program that helps low-moderate income families make their house painting more affordable. The program will reimburse homeowners up to $1,000 of material costs such as paint, brushes, tarps, and equipment rental. The reimbursement program is a great way to significantly reduce the cost of painting the exterior of a home. 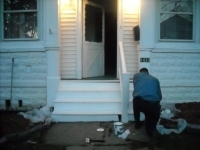 LakewoodAlive also has contractor evaluations to help homeowners find qualified painters; you can stop by the office in the INA Building or check them out on our website, lakewoodalive.com. LakewoodAlive can also provide one-on-one consultations with homeowners to help them review estimates and financing options that will be best suited for them and their project. Feel free to call Allison at 216-521-0655 or email her at aurbanek@lakewoodalive.com for more information.